Green curry from Maesri is similar to other brands of green curry paste that we carry. For a quick delicious Thai dish using this product, stir fry one can with 2 cups of coconut milk, and cook until it boils. Add 1 3/4 lb chicken, then add two cups coconut milk, and stir until chicken is tender. Add 1/2 lb eggplant, and keep stirring until cooked. Sprinkle with fresh Thai basil leaves, and fresh Thai chiles. Serves 5-7. Serve with jasmine rice. Ingredients: fresh green chiles, garlic, wild ginger, shallot, lemongrass, salt, kaffir lime, sugar, galangal, spices (corriander seeds, cumin, cardamom, turmeric), pepper. Maesri Brand is recognized in Thailand as a high quality export product with rich taste and authentic flavor. 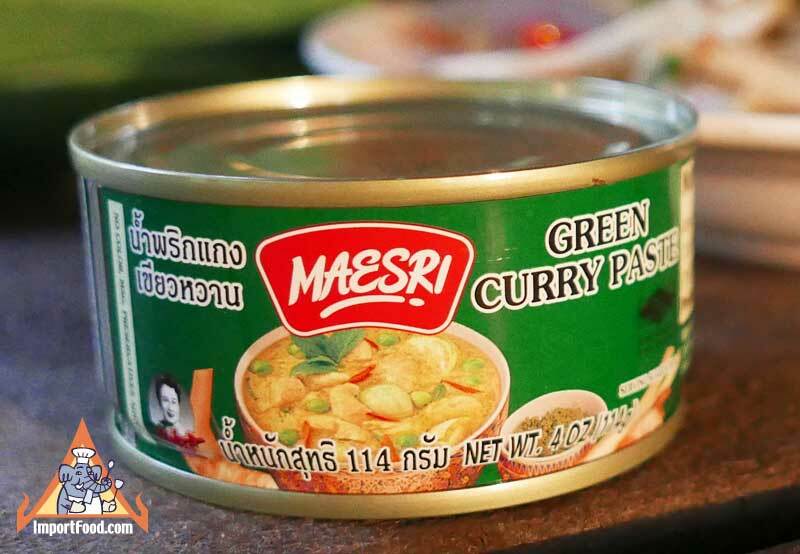 The convenient and inexpensive 4 oz can is enough for 6 large servings, and we ship this in case quantity to many restaurants who depend on Maesri to make their restaurant Thai meals. Chances are good that your local Thai restaurant uses Maesri as the base for their green curry. This recipe highlights the delicious Thai mini eggplant and it's a common recipe throughout all provinces of Thailand. It's easy to prepare, and almost always made with chicken & served with jasmine rice. Translation: Gaeng = spicy soup, khiao = green, wan = sweet, gai = chicken. We like to make it with lots of chicken so it's a hearty meal. Also note we also have a similar green chicken curry recipe here.